This article describes how global and SharePoint admins in Office 365 can change their organization-level sharing settings for SharePoint and OneDrive. For info about changing the external sharing setting for a site, see Change the external sharing setting for a site. To learn how to change the external sharing setting for a user's OneDrive, see Change the external sharing setting for a user's OneDrive. In the left pane of the new SharePoint admin center, under Policies, select Sharing. 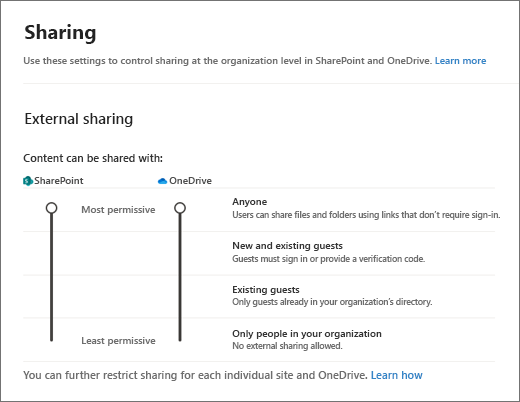 Under External sharing, specify your sharing level for SharePoint and OneDrive. The default level for both is "Anyone." The SharePoint setting applies to all site types, including those connected to Office 365 groups. The OneDrive setting can be more restrictive than the SharePoint setting, but not more permissive. The SharePoint external sharing setting on this page is the same as the one in the Microsoft 365 admin center, under Settings > Services & add-ins > Sites. These settings are also the same as those in the OneDrive admin center. Allow users to share files and folders by using links that let anyone who has the link access the files or folders anonymously. This setting also allows users to share sites with new and existing guests who authenticate. 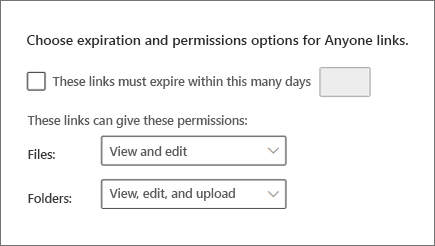 If you select this setting, you can restrict the Anyone links so that they must expire within a specific number of days, or so that they can give only View permission. Invitations to view content can be redeemed only once. After an invitation has been accepted, it cannot be shared or used by others to gain access. Allow sharing only with guests who are already in your directory. These guests may exist in your directory because they previously accepted sharing invitations or because they were manually added, such as through Azure B2B collaboration. (To see the guests in your organization, go to the Guests page in the Microsoft 365 admin center). If you turn off external sharing for your organization and later turn it back on, guests who previously had access will regain it. If you know that external sharing was previously turned on and in use for specific sites and you don't want guests to be able to regain access, first turn off external sharing for those specific sites. If you restrict or turn off external sharing, guests will typically lose access within one hour of the change. This is useful if you want to limit sharing with particular partners, or help prevent sharing with people at certain organizations. The organization-level setting on this page affects all SharePoint sites and each user's OneDrive. To use this setting, list the domains (maximum of 1000) in the box, using the format domain.com. To list multiple domains, press Enter after adding each domain. You can also limit external sharing by domain by using the Set-SPOTenant Microsoft PowerShell cmdlet with -SharingDomainRestrictionMode and either -SharingAllowedDomainList or -SharingBlockedDomainList. For info about limiting external sharing by domain at the site level, see Restricted domains sharing. By default, guests can receive an invitation at one account but sign in with a different account. After they redeem the invitation, it can't be used with any other account. By default, guests must have full control permission to share items externally. Choose the option you want to show by default when a user gets a link. This setting specifies the default for your organization, but site owners can choose a different default link type for a site. Specific people - This option allows users to enter external email addresses, but it's best for very targeted sharing because forwarded links won't work. Only people in your organization - If links are forwarded, they'll work for anyone in the organization. This option is best if your organization shares broadly internally and rarely shares externally. Anyone with the link - This option is available only if your external sharing setting is set to "Anyone." Forwarded links will work internally or externally, but you won't be able to track who has access to shared items or who has accessed shared items. This is best for friction-free sharing if most files and folders in SharePoint and OneDrive aren't sensitive. 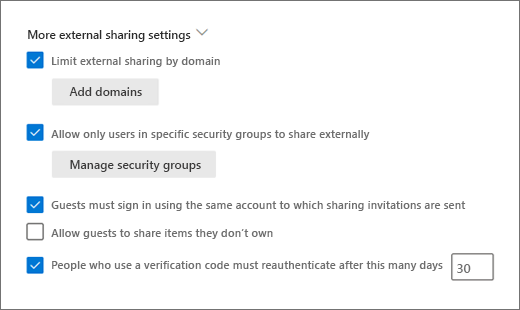 If you select "Anyone with the link," but the site or OneDrive is set to allow sharing only with guests who sign in or provide a verification code, the default link will be "Only people in your organization." Users will need to change the link type to "Specific people" to share files and folders in the site or OneDrive externally. Link permissions - You can restrict "Anyone" links so that they can only provide view permission for files or folders. On the classic sharing page, you can choose whether you want the default link permission to be view or edit. You can also allow only users in specific security groups to share externally. To see the security groups in your organization, go to the Groups page in the Microsoft 365 admin center.